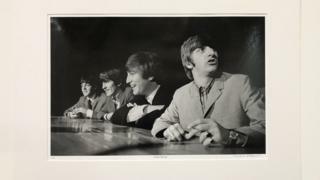 More than 350 previously unseen photos of The Beatles at two early US shows have fetched £253,200 at auction. Mike Mitchell captured the Fab Four arriving at the venues, at pre-show press conferences and on stage in Washington DC and Baltimore in 1964. A total lot of 413 negatives were sold with copyright for £253,200 by Omega Auctions. Forty-six of those have been seen before when auctioned in 2011. A black Mercedes AMG George Harrison bought in 1984 sold for £43,200. Mitchell photographed the band at their first ever US concert, at Washington Coliseum on 11 February 1964 - two days after their famous appearance on The Ed Sullivan Show. Mitchell was just 18 at the time and took the photos in natural light because he couldn't afford a flash. He was on hand again when they played Baltimore Civic Centre on 13 September 1964. He even got on stage to get a better vantage point. "I was very motivated to come up with stuff that was as unique as could possibly be," he said. "I looked and noticed that nobody was up on the stage. I thought, I wonder what it would be like to be up on the stage and see what I could get up there." Auctioneer Paul Fairweather said it was a "fantastic sale" which "shows that The Beatles market is still as strong as ever". The black Mercedes 500 SEL AMG was bought by Harrison in 1984 for £85,000 and he owned it for 16 years. It featured in the official video for the song 'Real Love'. Other items sold in Newton-le-Willows included a signed hotel register from a night at "The Bull" in Peterborough, which all four musicians signed along with manager Brian Epstein, which sold for £9,840.